Arrange 20 briquettes on one side of the grill. Place three dozen briquettes (half-way) in chimney. Carefully empty burning briquettes from chimney onto the other 20 (unlit) briquettes. You now have half the grill with briquettes, the other half empty. Place aluminum pan (we used a nine-inch circular one) filled with 1 inch of water onto empty half. Cover with grate, heat for five minutes. Combine all the rub ingredients in a small bowl & sprinkle the rub on both sides of each rack, pressing to adhere. Set racks aside; prepare grill. Combine honey, apple juice, and cider vinegar to create a basting liquid. 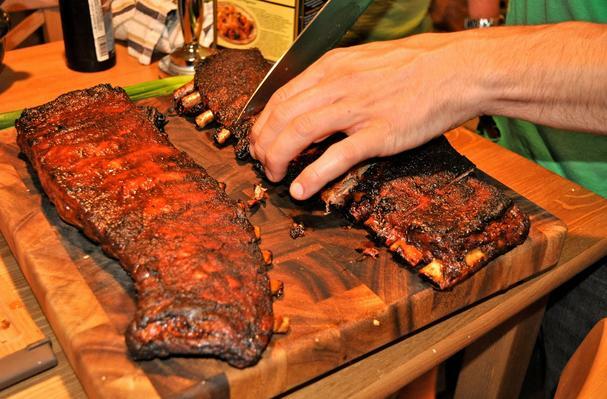 Flip ribs over, brush meat side with basting liquid and cook for 45 minutes. Baste again and cook until your grill dies down, we got about another hour. Place ribs in 300 degree oven until you hit a total cook time of approximately three and a half hours. Remove from oven & tent with tin-foil for 15 minutes before devouring. A snippet from bottomlesskitchen.com: "Although a cook time of over three hours may seem daunting, it is a GREAT way to grill out & relax with friends. Most of the time the ribs can be left relatively unattended...Great for company, but limited to two racks unless you have more than one grill."